826NYC’s centers and satellites have been bustling with students for after-school tutoring, field trips, and workshops since September. Now, programming is back in our East Harlem Writers’ Room. Launched in 2016, the Writers’ Room is a full-time writing program open to students and teachers at PS/MS 7 and Global Tech Prep. 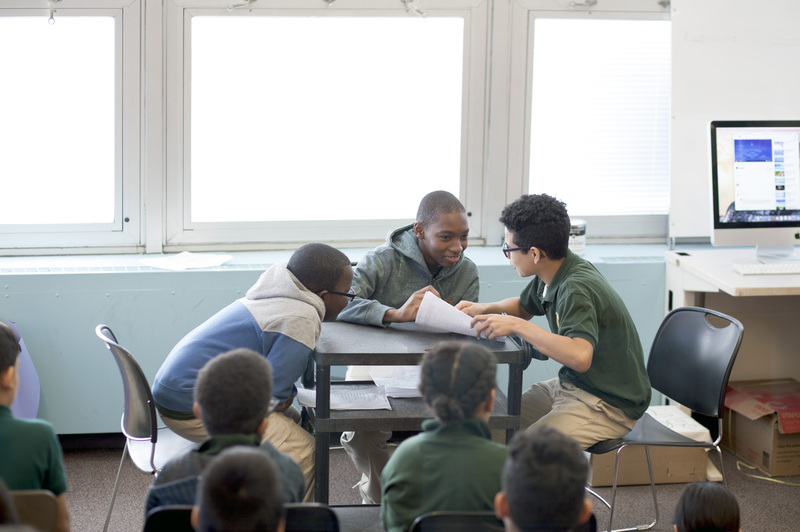 826NYC volunteers and staff support classes of sixth, seventh, and eighth graders that come to the Writers’ Room to receive individualized help and attention on writing projects. Last year, students from the Writers’ Room generated work for over ten publications, including Food Defenders, a perfect-bound publication with foreword by Karen Washington. This year, students will write everything from personal narratives to short stories to one act plays and more. We can’t wait to see what they come up with, to support their content and skill development, and to publish their work! If you’d like to get involved in the Writers’ Room, email aarti@826nyc.org or sign up for an upcoming volunteer orientation online.